On Friday, Cape Town will launch a pilot programme that will allow residents and visitors to the city to pay for kerbside parking in the central business district with mobile payments app SnapScan. The service will be piloted in conjunction with Street Parking Solutions, the kerbside parking marshals that operate in the city. 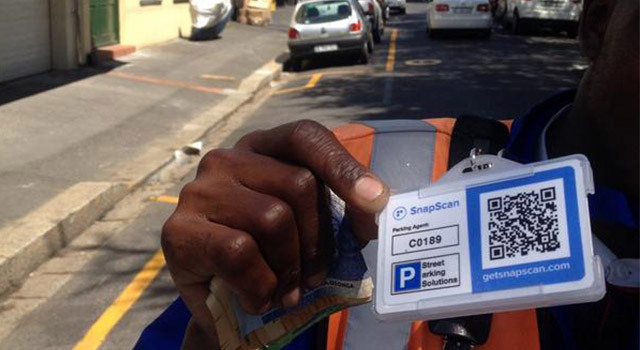 Should the pilot be successful, all parking marshals in the Cape Town CBD will be equipped with ID cards that feature a SnapScan QR tag and the parking agent number. “Street Parking Solutions is obliged to accept cash as payment for parking in the city, but can choose to accept other forms of payment as well. The city, however, is convinced that SnapScan will make payment for parking easier and more convenient for those road users who may not have cash on them,” says mayoral committee member for transport Brett Herron. Launched by Standard Bank earlier this year, SnapScan was developed in Stellenbosch by FireID. The app allows users to load a debit or credit card and pay for goods using a smartphone by scanning a merchant’s QR tag. SnapScan says that more than 14 000 businesses around the country now accept payments via SnapScan. Motorists will be able to pay for their parking by scanning the parking marshal’s SnapCode, which is unique to each marshal. When the SnapScan transaction has been finalised, the marshal will receive an SMS on their dedicated, SnapScan-supplied mobile phone to confirm payment. Motorists will also receive a printed parking receipt. Parking marshals accepting SnapScan payments will wear a Street Parking Solution and SnapScan logo on their bibs, says Herron. Cape Town has the highest SnapScan footprint in the country and several thousand users make purchases every week using the app. Bring it to shopping malls parking please. This is proper payments innovation. I never thought Standard Bank would actually start leading the innovation. Now all you need is for mr criminal to put his own “snapscan” code on the attendant’s card and the money will go directly to his own account.